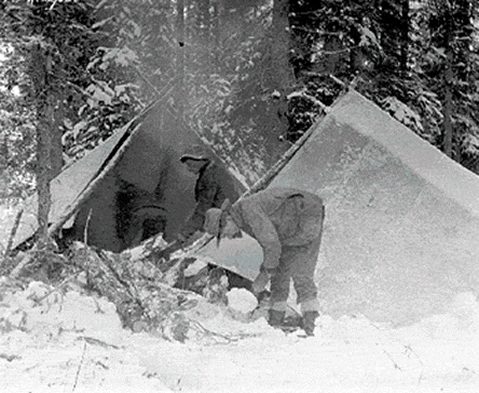 From 1869-1871-72 traffic went up the Stuart, and Takla lakes to Takla Landing. 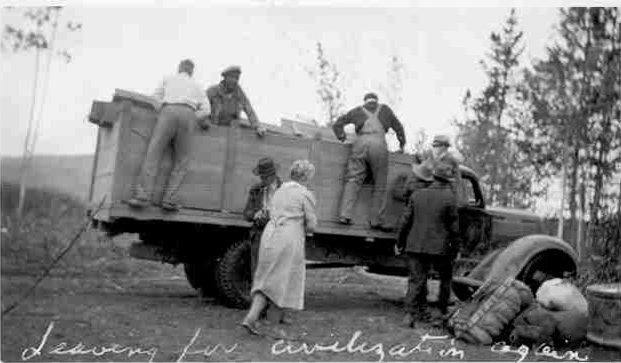 From there prospectors and freight traveled overland to the Omenica River. From here much of the freight would go down the Omenica to Old Hogem trading post. 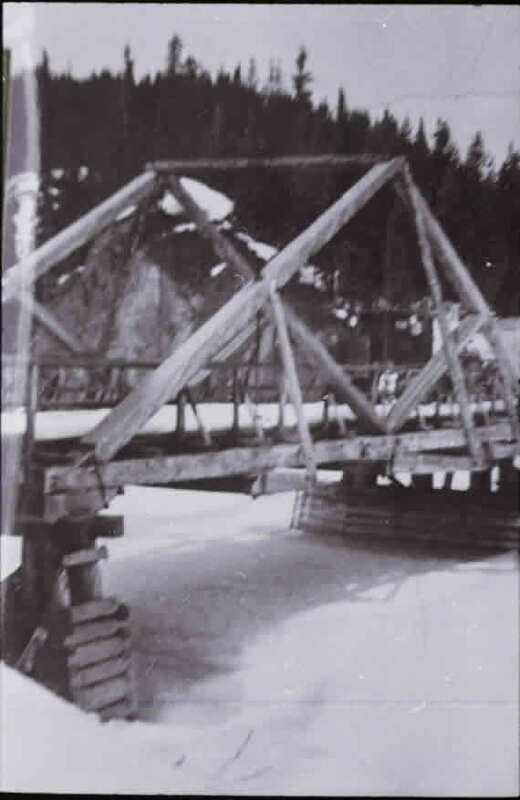 The rest would float down the Omenica to Germansen Landing where freight would be loaded on mules to be delivered to Germansen or Manson towns. 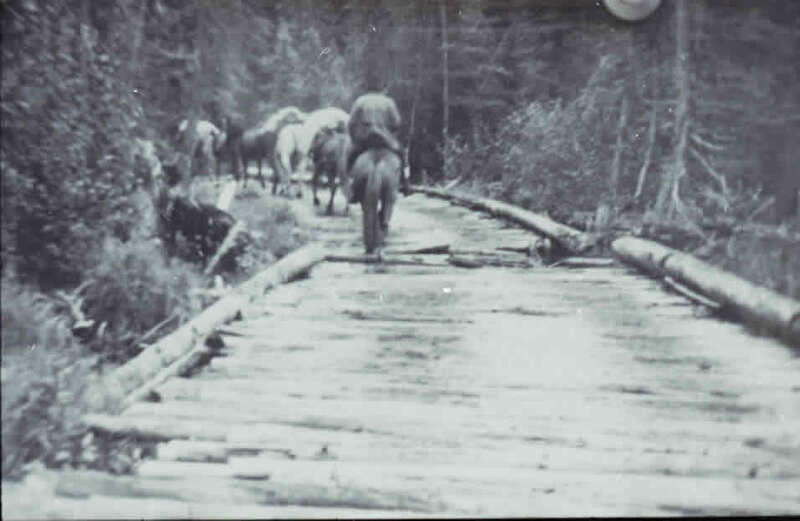 After 1871 Germansen and Vital creeks were already on the decline, a trail was built directly from Fort Saint James over Baldy Mountain to Manson Creek. 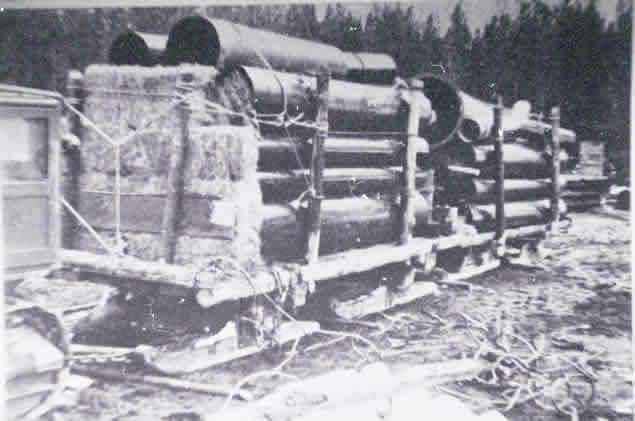 Most of the freight was brought in by horse and mule trains upper left. 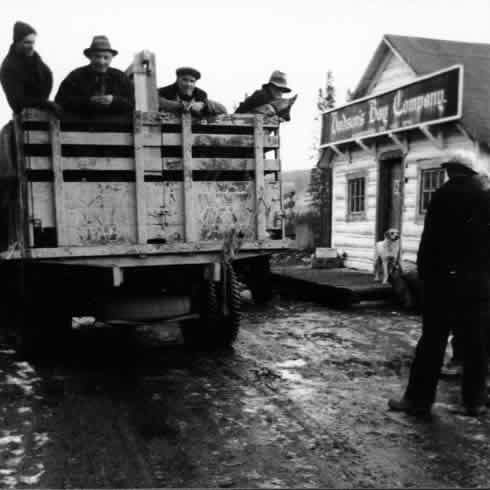 Some was brought by dogs as in the upper right shows dog train leaving Hazelton for Manson. 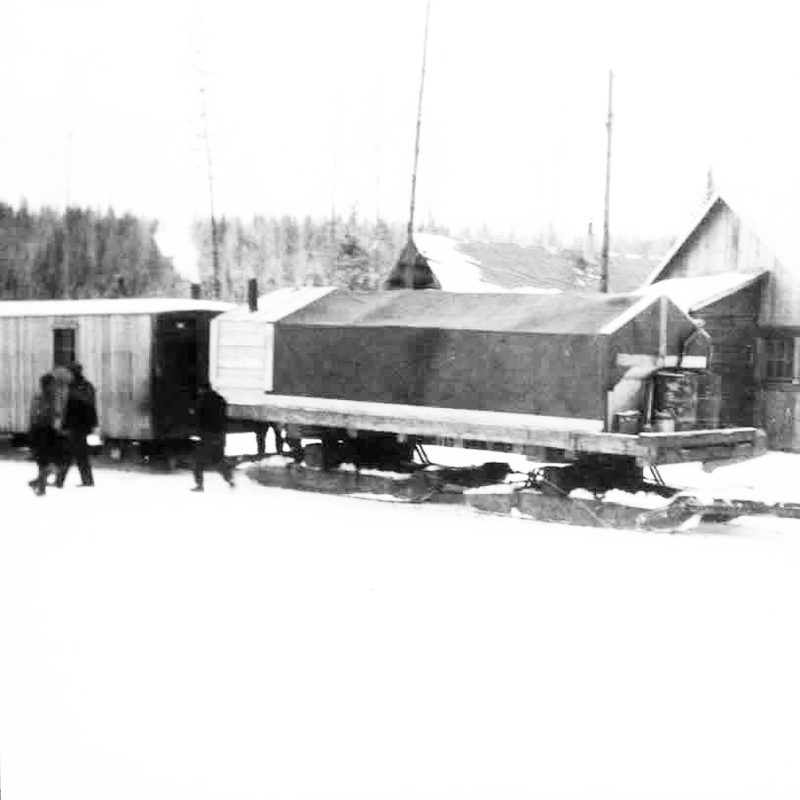 During the long winters the best way to move freight was using cat trains some as shown using a heated camp building. 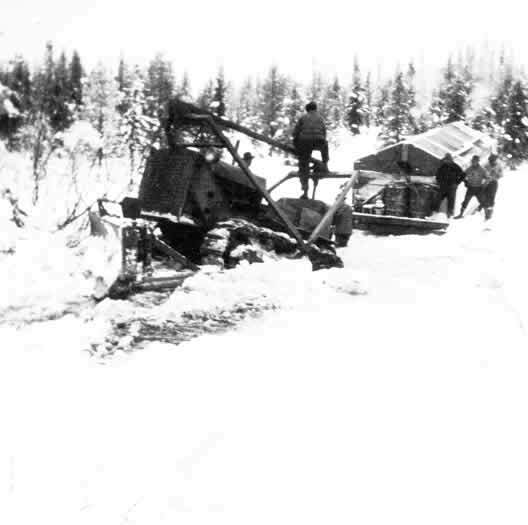 Photo on the right is cat train crossing a creek. More photos of cat train and cat breaking trail. At first the rivers and lakes had to be forded or barged. 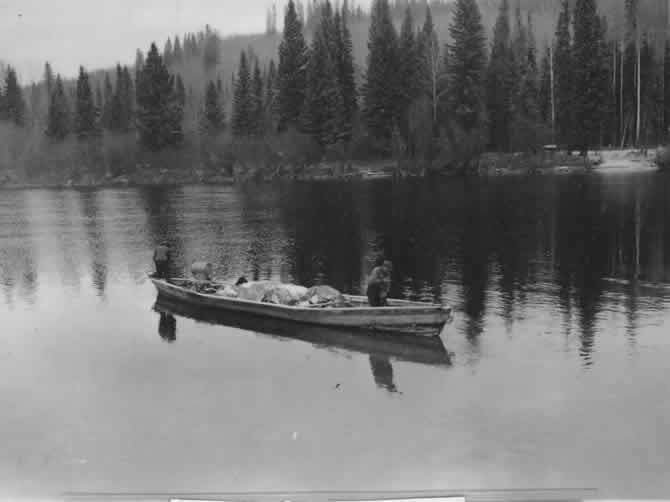 Upper left is Takla ferry on Takla Lake, right is barge on Germansen Lake, and lower photo is river boat and ferry on the Omenica. 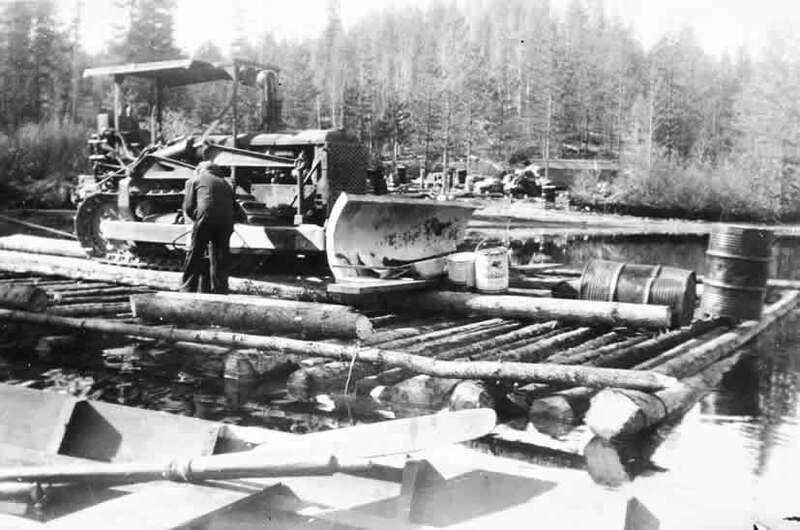 In 1933 the first Marion Steam Shovel reached Manson Creek. It took three years to travel from Ft. St. James to Manson and improved Baldy trail to the point where the first trucks began to arrive. 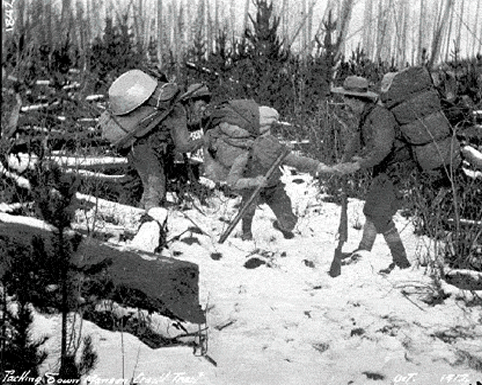 Top left is crew in front of Hudson's Bay and the right is leaving Kildare for civilization. 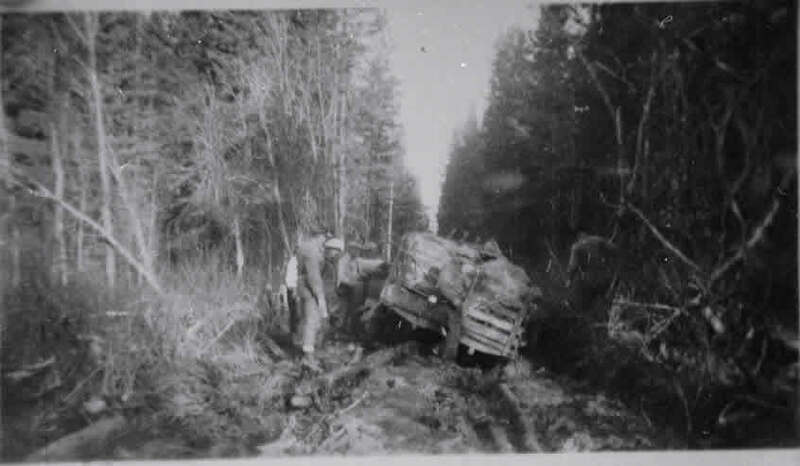 Truck stuck on Baldy trail, and corduroy section of the trail. 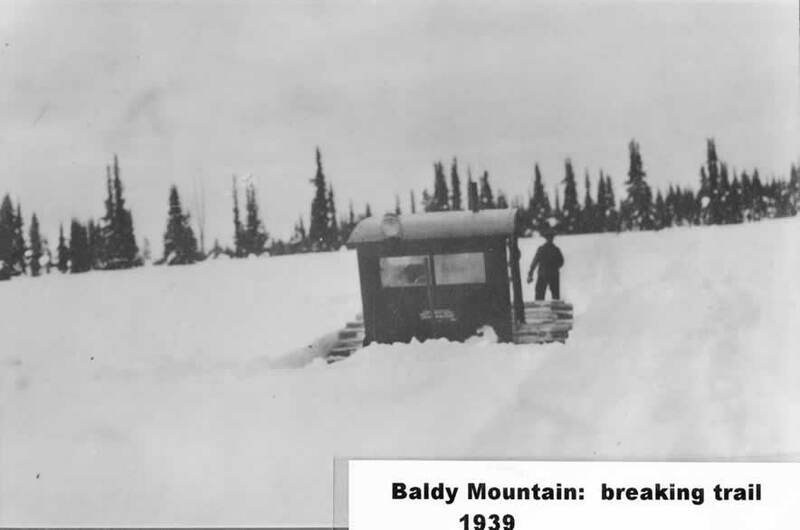 In 1939 the government built a new road around Baldy Mountain, many new bridges were constructed so that trucks could take over transport of goods and people. 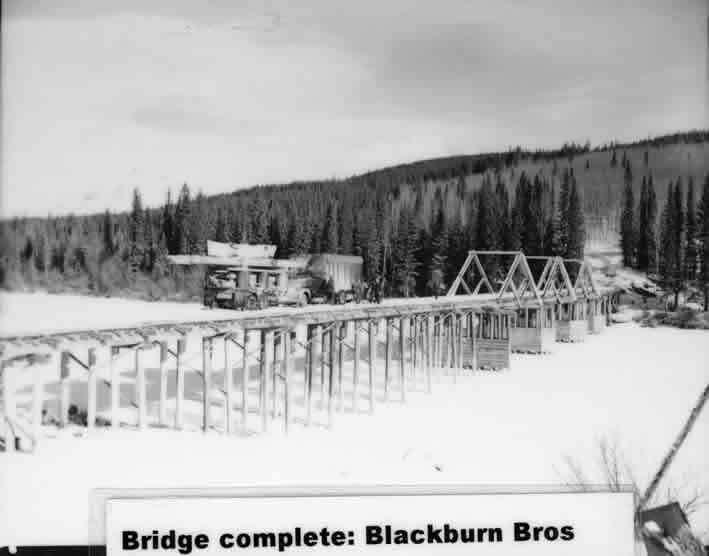 Upper left is the Nation River bridge and on the right is Omenica bridge at Germansen Landing. 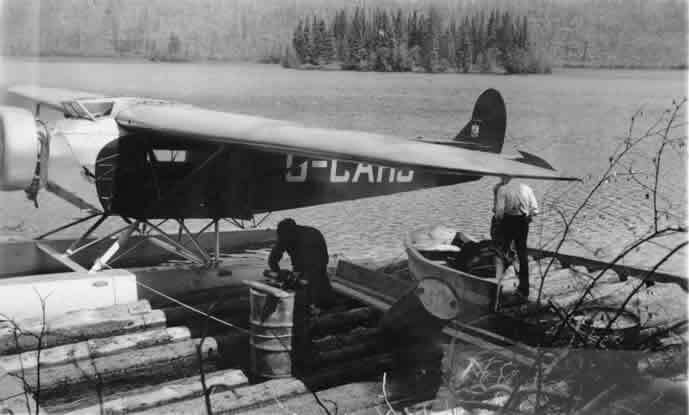 During the 1930s gold rush planes also were used to deliver people, freight, and mail. 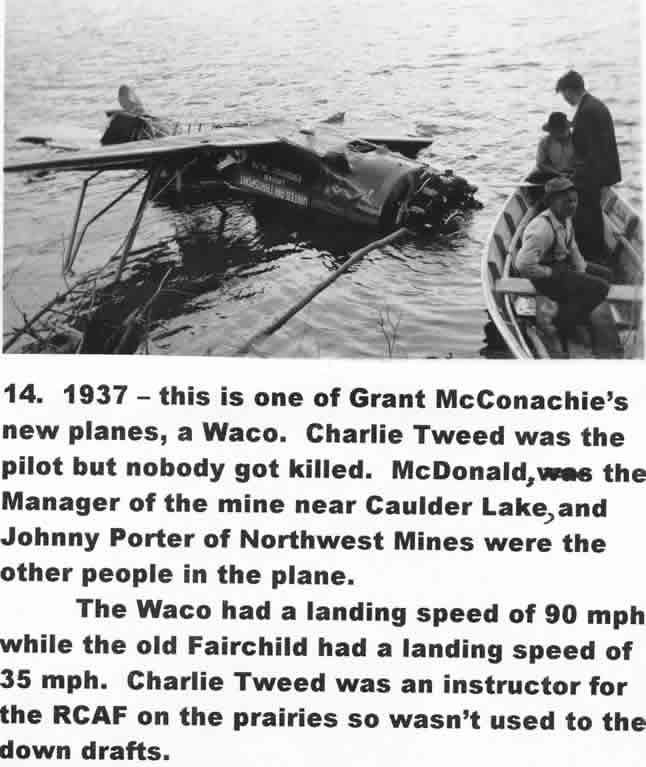 They landed on Wolverine, and Manson lake near Manson Creek. 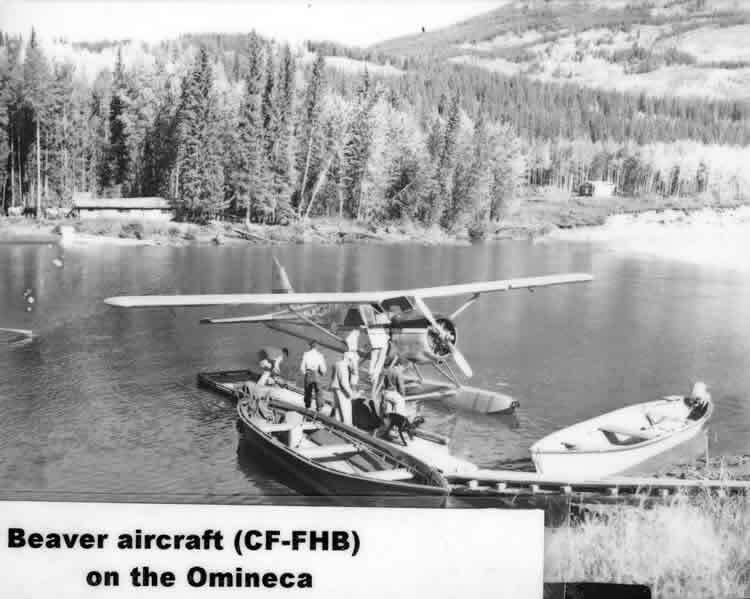 At Germansen Landing they landed on the Omenica River. Upper left is at Wolverine Lake, top right is on the Omenica. 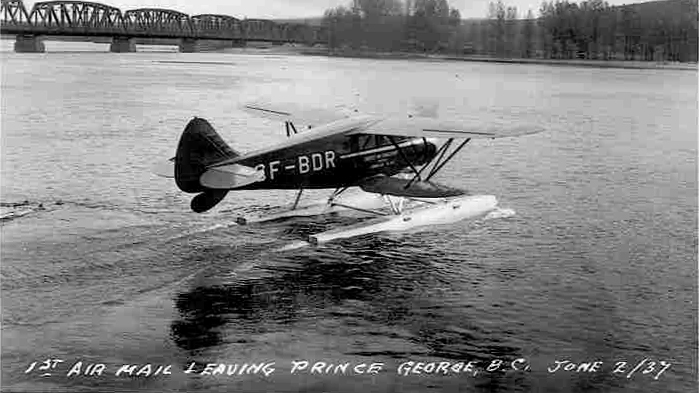 Lower right is the first mail plane leaving Prince George for Manson Creek. Lower right is a plane crash at Wolverine Lake.